Here you can see my evolving artwork. Read why I paint what I do and my thoughts about the paintings. Here is another little painting based on that same day in Annapolis. One can see that the composition of the boats is the same and that the only thing I have really changed is the colours of the boats. One might wonder why I repeat myself like this, but it is expressly to experiment. What happens when I change just the colours of the boats? I think that this painting grabs one's attention more than the previous painting (see it here) from two days ago, whereas the previous one has more of a pleasing softness. 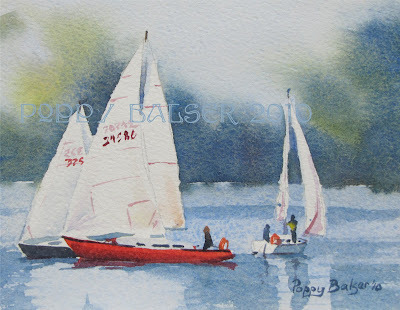 The focal point of this painting is most definitely the red boat, while in the sailboat trio I find that my attention moves back and forth between the foreground white boat and the red one farther away.